App update alert ⚡️ We’re so excited to announce our latest and exciting iOS App update: version 2.1. (Make sure you update in the Apple APP Store!) In our latest app update, you can discover user generated content right on your iOS devices… Yes! 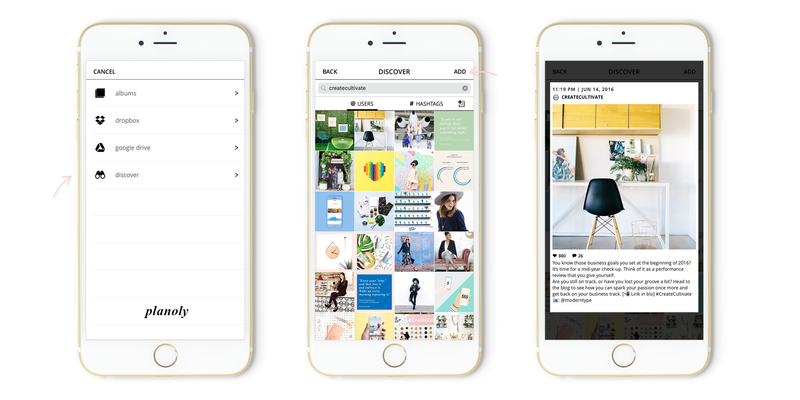 We’ve made Instagram content planning and regramming easier so you can plan on the go! Creating content is the hardest hurdle for a brand and business, especially if you’re shorthanded. What better way to promote and encourage your consumers to wear, share and spread your brand to their friends and family than by reposting their content. Discover (user generated content) on Planoly streamlines the process for brands and businesses to easily share content from your consumers, community and audience. 10. Your discovered media is now added to your Planoly Grid. So easy, right?! Now you can drag & drop to arrange your feed and plan as usual!